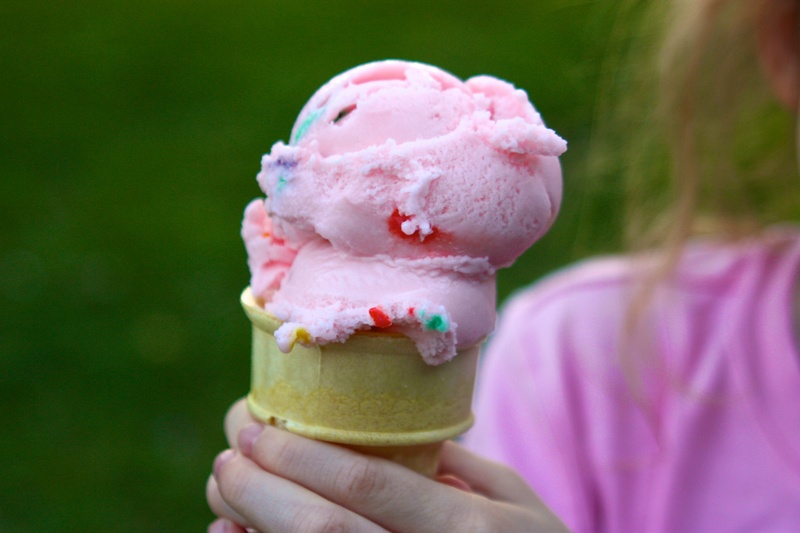 Bubble gum and ice cream, it can’t get better than that. Bubble gum was another one of those forbidden ice cream flavors when I was a kid. I’m not sure if was because my parents didn’t like the flavor when they had to help us with our drippy cones, or if it was the sticky napkin on the side with all the pieces of bubble gum piled up waiting to be eaten at the end. While I can’t guarantee this will be the cleanest ice cream experience, it sure is one of the most fun. There probably are bubble gum flavorings out there, but I decided that the easiest way to flavor the ice cream was to use actual bubble gum. I used Bazooka for the “tea” to flavor the ice cream and then these cool Bazooka nuggets are mixed in at the last minute. Have fun! 2 tablespoons mild oil: canola, avocado or coconut. Put the marshmallows in a big microwave safe bowl (I have an 8 cup Pyrex that is perfect for this). Whisk the soft marshmallows until smooth, then slowly pour in the soy creamer. Microwave for another 3-5 minutes, stirring every so often, until the creamer is hot but not boiling and the marshmallows are melted. Meanwhile, unwrap the bubble gum and place in a piece of cheesecloth and fasten with a twistie tie. Place the gum “tea bag” into the warm creamer and allow to steep and cool in the refrigerator. 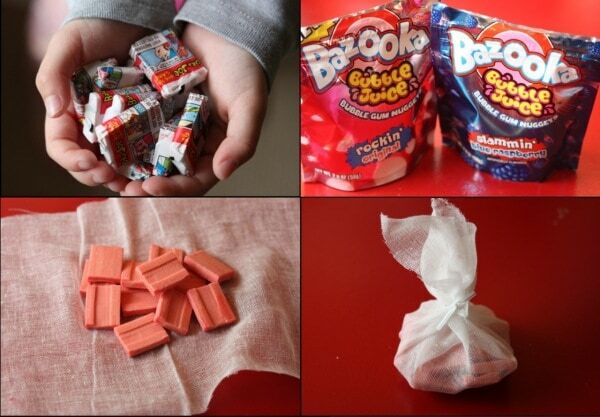 When the cream is cold, remove the bubble gum bag, give it a squeeze and throw away. Add the oil and food coloring. Freeze in an ice cream maker. I have a Cuisinart that works well. At the very end of the freezing, pour in the candy-coated gum and mix it around briefly before transferring the ice cream to a freezer container. No, don't go! 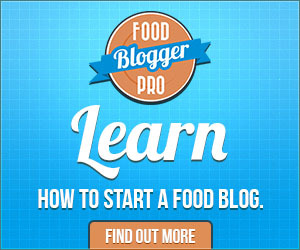 You are my cooking inspiration! How in the world did you find out you had been splogged?!?! And the new layout looks FAB! Oh dear! I would be so sad if you left! I'm just lactarded, but as I have so many friends with allergies that parties are all potluck so that everyone feels comfortable bringing safe food…. I really appreciate your entries!! Ugh, Camille, I was googling some of my phrases to see if my permalinks were fixed and found another website with all my posts. Very annoying and creepy. I had to file a plagiarism complaint with bluehost, the cheater's webhost to see if they can get booted off the host for violation their terms of service. I do have to say that the whole idea of bubble gum tea kind of makes me want to barf. Really. 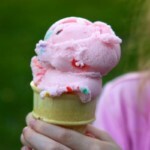 Fortunately my peeps haven't discovered bubble gum ice cream yet. That's why you have you fill your own mouth full of Bazooka and chomp on it while steeping the tea! I forgot how big the bubbles can get and it's not like we have peanut butter around here to get gum out of (my) hair!